You know when you read the blurb of a book and just know that you're going to love it? 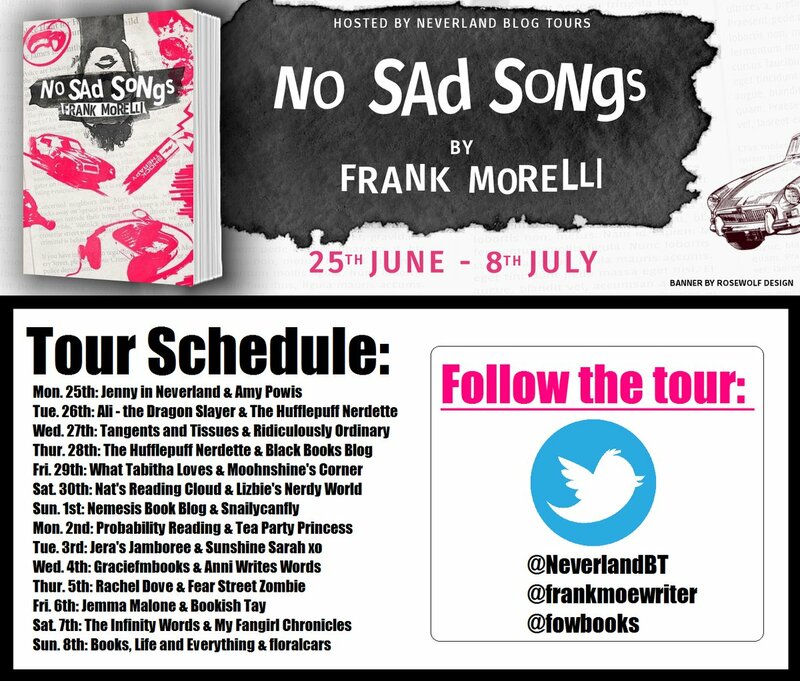 That happened for me with No Sad Songs by Frank Morelli, so when Neverland Blog Tours did a call out for bloggers I was ON IT. Following a family tragedy, eighteen-year-old Gabe LoScuda suddenly finds himself thrust into the role of caregiver for his ailing grandfather. 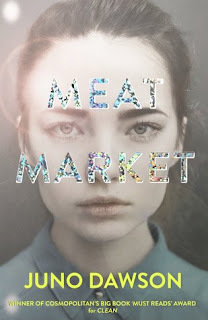 Between the shopping trips and the doctor visits with Grandpa, Gabe and his friend John try to salvage their senior year, meet girls, and make the varsity baseball team. It doesn’t take long for Gabe to realize that going to school and looking after a grandfather with Alzheimer’s is more work than he ever imagined. And when long-lost Uncle Nick appears on the scene, Gabe soon finds that living with Nick and Grandpa is like babysitting two grown men. Aside from John, the only person who truly understands Gabe is Sofia, a punk-rocking rebel he meets at the veteran’s hospital. When these three unlikely friends are faced with a serious dilemma, will they do what it takes to save Grandpa? If there’s a chance of preserving the final shreds of Grandpa’s dignity, Gabe may have to make the most gut-wrenching decision of his life - and there’s no way out. 5 Words: Family, responsibility, friendship, loneliness, help. 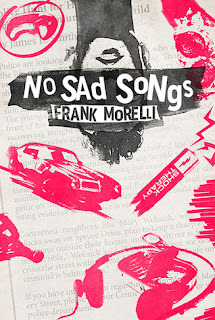 No Sad Songs is quite a difficult book to read, and definitely a difficult book to review. It explores so many hard-hitting issues and situations with nuance, and I've probably rewrote this entire review about five times. It's not all fun, but it's not all doom and gloom. Despite starting with earth-shattering grief, the books still managed to make me laugh. I loved the exploration of friendship. Honestly, John is the best friend anyone could ever have. He's so supportive and selfless and it broke my heart a little how good he was to Gabe. He's there for him. All of the characters have real depth and it really endeared them to me. A young boy who only really cares about pizza and his crush is forced to change completely and take on new responsibilities when a terrible tragedy turns his world upside down. The devastating impact of Alzheimer's on those who suffer from it and their carers really hit home and made me cry a fair few times. But the way Gabe deals with his lot, caring for his grandfather, growing up too fast, is excellently covered. Grab this book and grab some tissues, cause you'll need them. This book sounds very intriguing! I'm always a bit reserved when it comes to stories that are more serious/on the dark side, but this one sound -as you describe it- more nuanced. I'll be sure to check it out! With a title like "no more sad songs", I expected I'd need some tissues. I haven't read a book featuring alzheimers yet. 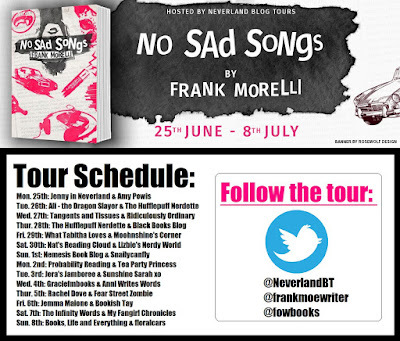 I'll definitely add this to my TBR. Solid review!